I've come to believe the essence of team sports — its purest form at the highest level you can find it — can be experienced on Division 3 college campuses. No athletic scholarships in D-3. No TV contracts and very few sponsors. Athletes with very little chance of making a career out of their game of choice. And free admission to many events for the few hundred fans who might attend a “big” football game. I spent much of last week in Connecticut, on the campus of Wesleyan University, where my daughter, Sofia, is studying (and competing for the Ultimate Frisbee club, Vicious Circles). On Friday night, Sofia forfeited the latest screening in the campus film series (Oscar-nominated animated shorts) for a hockey game at the Freeman Athletic Center. The 12th-ranked Cardinals hosted 11th-ranked Trinity College in a clash between the top two teams in the New England Small College Athletic Conference (NESCAC). I’ve been to my share of hockey games, and this was the best I’ve ever attended. Trinity scored first, but the Cardinals rallied with three unanswered goals and took a 3-2 lead into the third period. 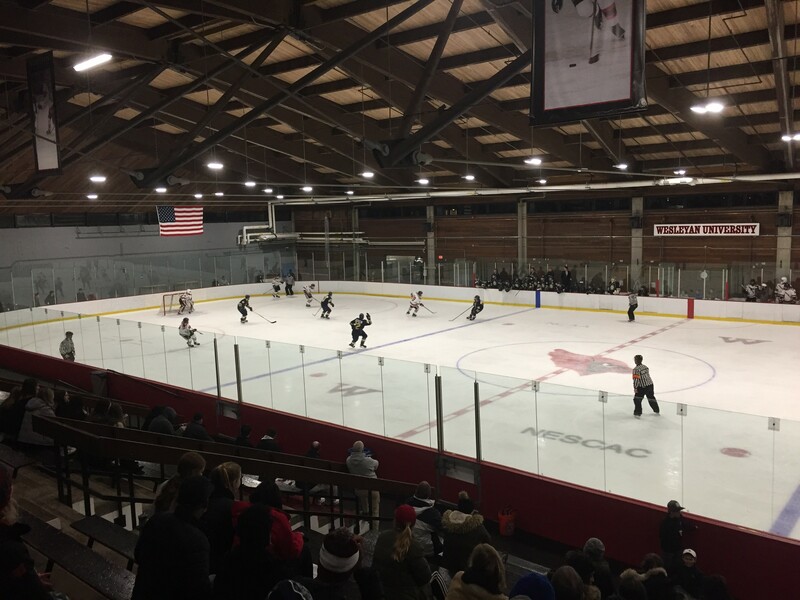 The Bantams scored two goals early in the third, but Wesleyan rallied with two of their own for a 5-4 lead that brought most of the crowd — all 300 of us — to our feet. Alas, Trinity scored the game’s final two goals, the game-winner with just 1:33 left to play. Eleven goals and four lead changes. If such a game occurred in the Stanley Cup playoffs, it would be replayed ad nauseum on the NHL Network. Be glad you got to read about it here. There was no advertising on the ice or boards. Sofia purchased a bag of candy for $2.50. We sat near center ice, with plenty of elbow room between us and the Trinity cheering section. (The school is in nearby Hartford. This was a D-3 hockey version of Memphis-Ole Miss.) Wesleyan’s top scorer, Walker Harris, scored his team’s last goal. And Harris will eat in the same dining hall Sofia does, unrecognized by most students who aren’t his teammates. A student who happens to be an athlete, and a very good one. Imagine that. 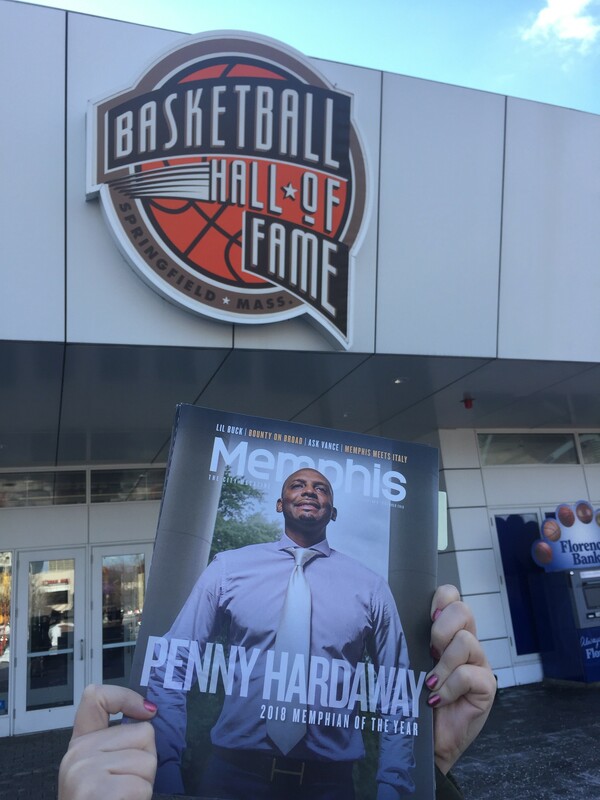 • I hand-delivered a copy of the December issue of Memphis magazine to the Basketball Hall of Fame in Springfield, Massachusetts. 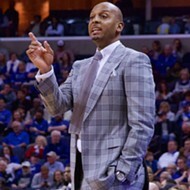 The issue includes my case for Penny Hardaway’s induction. On the day I delivered the magazines, the Hall announced its finalists for the 2019 class, and Hardaway’s name is not on the list. The man Orlando traded to Golden State for Hardaway during the 1993 NBA draft (Chris Webber) did make the cut. Number of first-team All-NBA selections: Hardaway 2, Webber 1. Should you have any doubts about Hardaway’s credentials for enshrinement, consider the name of a 2018 inductee: Dino Radja. Debate over. • The Hoop Hall presents honorees in a dynamic, but inefficient, manner. A large, black-and-white, photo of each Hall of Famer is backlit and stares down from the domed roof of the facility. But there is little order to where you might find one Hall of Famer or another. They are not grouped by induction year. They're not alphabetical. And they don't correspond to the information panel that rings the platform below where visitors can read about each basketball legend (by induction year). Furthermore, the photos need to be more carefully chosen, with players as they appeared in the prime of their careers. Larry Bird, for instance, doesn't have a mustache in his Hall of Fame portrait, taken near the end of his days with the Celtics. At the very least, the induction year needs to be added to the Hall of Famer's name, so a visitor can cross-reference the information panel below.